I have four sons, so I am always interested in age-appropriate materials with titles that include words like "active." 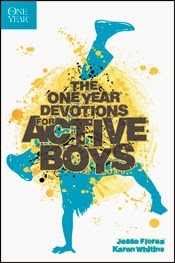 The opportunity to review The One Year Devotions for Active Boys by Jesse Florea and Karen Whiting sounded perfect. It arrived, and I pulled it out, called my 10-year-old son, and started to dig in. The book is dated, so the first dilemma I faced was whether to start at Jan. 1, or whether to jump to September. The Jan. 1 entry has an activity that involves paper plates, balloons, and tape. I didn't have plates or balloons, and the active boys of my household are forever losing tape. I closed the book, determined to buy things and start fresh soon. And then the book sat. Two weeks later <sigh> I dug the book out again, without kids around, and started reading. What I discovered was that most of the activities don't require anything stranger than a pencil, the lessons are memorable even without the activity, and I really can actually use this. The other reason I should have just jumped in with the lesson for the actual date is that some of the materials are seasonally appropriate. Towards the end of November, for instance, there are a few days that deal with thankfulness. Today's lesson is an example. October 10 is titled "Thanks Be To God." The first thing that happens each day is a few paragraphs of "devotional" and this one is about Thanksgiving, and the fact that different countries celebrate at different times (2nd Monday in October in Canada is one example given). After the devotional, there is some type of activity. For today, it is a fairly un-active one. They are to match up holidays to the country where they happen. Each day also has a brief prayer suggestion -- "Tell God you're going to be thankful to him forever and ever and ever." Finally there is a scripture. Some days are more active. Like that January 1st one where they are to make UFOs out of paper plates, balloons, and tape. I'm setting this book aside now that we've played with it some, and I am going to work through it starting in January of 2015. I really like the messages and the memorable activities. I just need to be sure to look ahead so that I have what I need on hand.